Of the pubs that I’ve so far reviewed this is the only one to which I have been a frequent visitor as it’s about 5 minutes from my flat and I’m lazy. That’s not to say that I usually only walk to the first pub I see in any direction it’s just that this is the closest pub to me that doesn’t give off the impression that I might get stabbed or robbed on my way in/out, one of the many perils of living in east London. 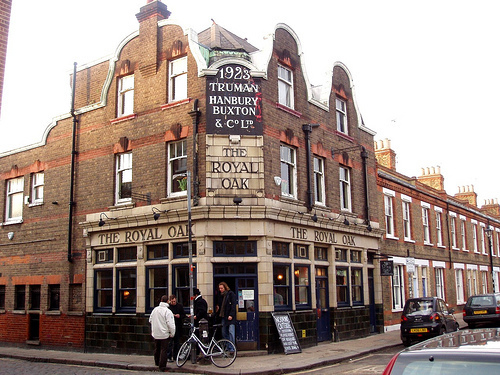 The Royal Oak hugely benefits from its setting on the mind blowing trendy Columbia Road; surrounded by shops selling pretty crap you don’t need and beautiful houses you can’t afford. It’s still an attractive pub regardless of it’s location though with a nicely tiled exterior, stunning wooden panelled interior with a grand central bar around which is the seating. Getting a seat is often a pain in the arse though as there’s not a lot of it and it’s all a bit badly thought out, you’re likely to end up having to share a table with some ‘creatives’ talking about ‘art’ or ‘fashion’, another of the perils of living in east London. Beer offerings are always a bit sparse, ‘Doombar’ is an old favourite of mine and is always on draught but there is rarely anything else on offer despite an array of lager beers. They do tend to offer seasonal fare though such as mulled wine, cider and Pimms for people pretending to be posh and like tennis when it’s hot. Bar staff are always painfully good looking at the same time as being really nice often making you feel as if you’ve walked into an All Saints advert. I suspect this selection of particularly hot bar staff is done in a vain effort to distract you from the fact that you’ll get next to no change from a tenner for two pints. On the whole I’d say that it’s worth popping down to this place. If you do it on a Sunday you get to enjoy the flower market that takes place down the road too, an experience worth having, even if you do have to battle past endless throngs of people with SLRs taking pointless pictures of dull flowers. The pub has a friendly atmosphere on any day and you could do far worse.